Here at the Turney house, we try for Meatless Monday on a pretty regular basis. Inevitably though, the meal ends up being more about eggs, beans and cheese. Nothing wrong with that, but I lean much further to the vegetarian (TONS of vegetables) side of thing than the rest of my clan. Whenever the family is away, I stock up on produce from the farm stand and immerse myself in Veggie Heaven. I often feel so virtuous that I can rationalize the bowl of ice cream at the end of the day. While in Italy I definitely lean toward a vegetarian lifestyle. Despite the delicious bistecca, the prosciutto and salamis that are truly divine, I find that what I can't resist are the veggies. everything seems to be bursting with flavor, every vegetable seems to taste better. And lest you think that I am being a complete health freak, do note that many times these veggies are fried or come with a gorgeous cheese accompaniment. The new mayor of Turin, in the region of Piedmont, is causing quite a stir. She has pledged to promote vegetarian and vegan diets as a priority in her administration. Not sure what that means, but I am sure it is not sitting well in a city where signature dishes include beef tartare and vitello tonnato (veal in a tuna sauce). The initiative has been met with much skepticism, which is understandable. 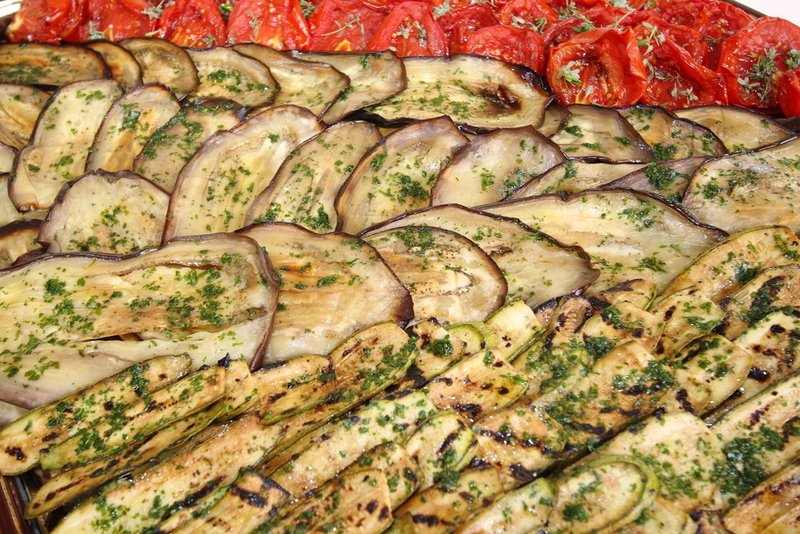 However, being a vegetarian in Italy is not hard to take. Some of my absolute favorite Italian dishes are vegetarian and a few are even vegan. Here are 8 dishes that will make you consider surrendering your Meat Lovers of America membership card. Pomodoro al Riso - I made these last week and I can’t get over them. I literally could eat these every single day during tomato season. These are a staple in Roman take out places and they are meant to be eaten at room temperature which adds to the convenience. These are actually vegan, contain only one tablespoon of rice per tomato and are a perfect summer lunch or side dish with dinner. Carciofi alla Giudea - I don’t make these but I dream about them on a regular basis. Rome again, this time from the Roman Jewish culinary tradition. A whole artichoke is cleaned and fried in oil until the leaves are crispy. A sprinkle of salt and that is it. (also phenomenal with a side of prosciutto but as this is a vegetarian blog post, let’s pretend I didn't say that). Ribollita - winter vegetables, stale bread and beans. This is true peasant cooking and drizzled with a rich olive oil, it is a hearty and satisfying lunch. Pappa al Pomodoro - similar to ribollita in that it uses stale bread but its base is tomatoes along with basil, a little onion and lots of fruity olive oil. Panzanella - panzanella is very trendy right now. You can see it in lots of restaurants for a salad course, main course or even dessert. more often than not, it is a salad with large toasted croutons. Delicious I am sure, but a true Panaznella has stale bread that is soaked in water then squeezed out until it falls apart into little crumbs. Add olive oil, red wine vinegar, tomatoes, basil, cucumbers, salt and pepper. Buonissimo! Insalata di Riso - after my junior year abroad, I took a job as an English tutor for a Florentine family. I suffered through many a meal that included veal, chicken and yes, even tripe. I was not a happy camper. One sweltering June afternoon we were called to the table for lunch and there was an enormous bowl of rice salad - tomatoes, basil, rice, cheese, olives and corn were tossed with rice, olive oil and vinegar. I must have eaten three bowls of it as Signora Scansetti beamed with pride that I was finally taking seconds (and thirds). This is another perfect summer lunch. Scamorza with Grilled Vegetables- When smoked mozzarella is grilled, it stays in tact because the smoking process creates a skin on the ball of cheese. When you cut into it, the interior is hot and melted. This alongside grilled mushrooms, radicchio, onions, peppers, zucchini and eggplant with a side of crusty bread is a dinner I could eat every single night. Blanched Asparagus with pecorino and truffle oil - I learned this from the elegant Enrica Rocca who served it as an appetizer along with grissini (thin breadsticks) and prosecco. It's a perfect way to start a festive evening. A traditional dish from the Roman take out restaurants. It is perfect in the summer. I learned this delicious, easy recipe at a cooking class in Venice. A great and elegant appetizer. A traditional Florentine dish that is perfect with a big glass of Chianti on a chilly autumn day.